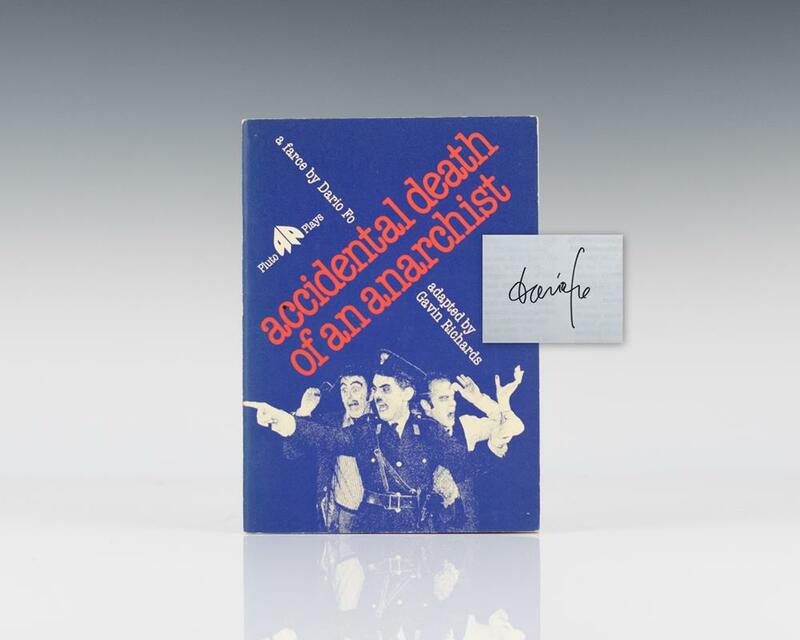 The Accidental Death of an Anarchist. First edition in English of the playwright’s masterpiece. Thin octavo, original illustrated wrappers as issued. Signed by Dario Fo on the the title page. In near fine condition. Dario Fo is the recipient of the 1997 Nobel Prize in Literature and is "[a]rguably the most widely performed contemporary playwright in world theatre" (Mitchel, 1999). The Accidental Death of an Anarchist shows that "[t]he quality that makes Fo uniquely powerful [is] the ability to wring wild laughter out of insidious corruption" (Guardian). "Simon Nye's witty translation updates and relocates the play suitably close to contemporary England. Fo is that rare thing, a far-left playwright with a popular, comic touch. And his stinging attack upon the black arts of government cover-up, manipulation and mendacity could not be more timely" (Evening Standard).